3D animation is a rare profession, one where the average age of the people working in the industry is higher than the age of the industry itself. Eric Guaglione, Animal Logic's head of animation was one of the few people involved in the early days of 3D animation when the medium was taking its first tentative steps into creature and character animation. Eric started in the film industry in 1982, the year that the original Tron film was released. In the following exert from my interview with him he describes starting work at Digital Productions where he was employed as a computer animator alongside Chris Bailey and Bill Kroyer, one of the animators on the original Tron film. Here are some examples of the work Eric describes. The opening sequence of the 1986 film Labyrinth is below and the 1988 Prudential Commercial where Eric assisted in creating the eagle can be viewed HERE. I've done a bit research and I believe the Cray X-MP supercomputer is the computer Eric talks about at Digital Productions. It was used to render the high polygon count (for the time) models at film resolution. In 1985 Bell Labs (a research and development organization) purchased a Cray X-MP/24 for $10.5 million along with eight DD-49 1.2 GB drives for an additional $1 million. It required approximately $12,000 per month for electricity, and approximately $50,000 monthly in maintenance. Many in the industry claimed that this kind of expense could not be justified by the kinds of contracts that existed in the effects industry at the time. 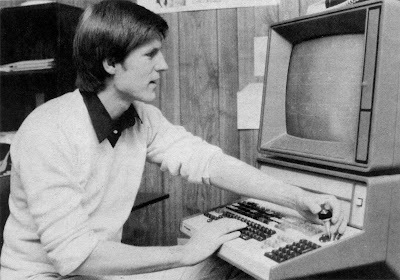 Here is a picture of Bill Kroyer working at an early 3D work station. An interview with Bill where he describes the even more bizarre process of animation on Tron can be found HERE. I find it astonishing to think back to these first days of 3D animation and contemplate what it must have been like to try to create animation with a spontaneous feel with that equipment and the incredibly labour intensive processes involved. Current computer animators owe a great debt to the artistry, talent and perseverance of these early pioneers in this art form. If you would like to hear more from Eric, you can find my previous 'Animation Bodcast' where he talks about an early Roger Rabbit 2 test HERE.